It’s Day 220 of “365 Things to do in Cincinnati” and today we are featuring the wonderful Sugar N Spice Restaurant. Don’t let that funky exterior fool you, what lies within those pink walls is pretty darn yummy! 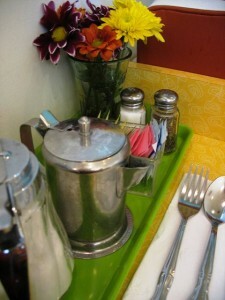 This was our first visit to Sugar N Spice (but it won’t be our last!). Located on Reading Road, just south of the Norwood Lateral, we’ve probably driven by it a hundred times and never noticed it. Sugar N Spice is open for breakfast and lunch every day and I think they have dinner on Thursday-Sunday (it was listed on the menu but it’s not on the website so check before you go). We arrived at lunchtime but after seeing everyone at the counter with some scrumptious looking breakfast dishes, we decided to have breakfast for lunch! 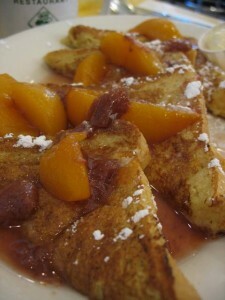 My hubby had the peach french toast with a side of grits and some coffee. I tried the french toast and it was incredible. He even commented that the coffee was good (maybe the best coffee in the world, “Elf” fans!). I was thrilled to see they offer half portions of many menu items. I had a half order of banana pancakes with a side of bacon. I am still talking about the bacon. Seriously, we talked about it at dinner tonight. 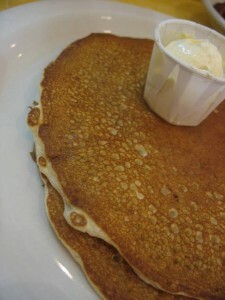 The pancakes were light and airy and the syrup was incredible. The place is not huge but they manage to utilize every square inch. There are plenty of seats at the counter (see pic at the top) and a number of booths as well. The decor is funky and fun. 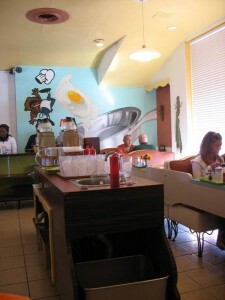 The walls have hand painted murals on them and the tables have a retro vibe with red vinyl and swirly formica. 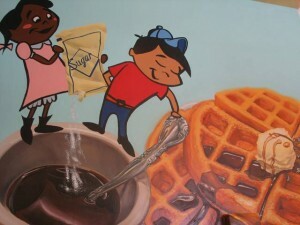 I have been going to Sugar’n Spice since before I could walk with my father… It is a Cincinnati institution that has been around since the drive-in era and my kids love it too. It is very family friendly, food is great, and they get VERY busy on weekends so prepare to wait or get there very early! 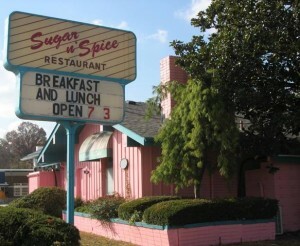 The first time I went to Sugar and Spice was in the 60’s. The place is still great and the food is delicious. The prices are greqt and all the food is cooked fresh. Its very busy on the weekend so make sure you have time to wait. 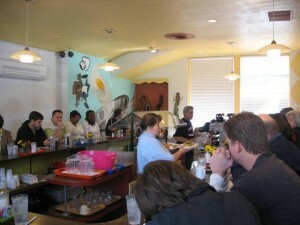 Sugar n Spice should and most likely is the first choice for breakfast/lunch dining in the city for most cincinnatians with first watch far far behind in second place. From the decor, to the wait staff to the owner almost always around during operating hours, sugar n spice screams down home cooking and service as well. Regardless of how busy they are, the staff always finds a way of making your visit personable and one that will have your mouth salivating at the crack of dawn for days on until you return for more. I love Sugar & Spice. My daddy and my Aunt both work there. I love the omelets. You can put whatever you like in them and they are huge. I can never finish and have to take the rest to go. It’s great as left overs too.